50+ eggs shipped in REGULAR PADDED FIRST CLASS ENVELOP. NO TRACKING. W​ARNING- by opting out of the shipping upgrade, merchant is not responsible for lost shipment. Photos will be provided as proof, but there is no guarantee your order will get to your place on time. If you like to have your eggs orders upgraded from a padded first class envelope to USPS parcel with Tracking information, please add this item to your cart. This upgraded shipping also comes with a bonus hatching cup. Please always ensure you have the right ambient temperature and 75% humidity to ensure the best hatching rate. Eggs are always recycled and fresh for your best rearing experience. This is the best way to ensure your eggs arrive to you in good condition and on time. What are the differences between these eggs? 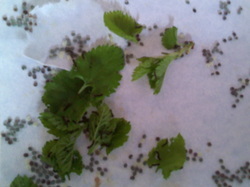 Hatchlings (kegos) feasting on fresh tender leaves. READY to hatch eggs. 2017 stock. These eggs have been treated to hatch at your place without you having to do much but provide the right RH and temperature. (They CANNOT go back to the fridge; they will be killed if they do.) The South African strain are a hybrid of sorts. 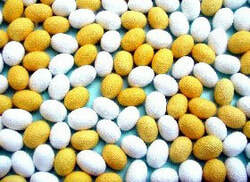 They will throw zebras, whites, tigers, and will have all sorts of colored cocoons. They are touted to be strong and hardy to due the tough conditions of the south african climate. Stock silkworms are just whatever I have, could be uniformly zebras, whites, or a mixed hybrid. SOUTH AFRICAN DIAPAUSED eggs 2017 OUT OF STOCK. They are fully treated for refrigeration only at arrival at your place. Buy them in bulk and place them in the fridge crisper in a ziploc bag (make sure it is not torn to prevent dessication) Remove them after 50-60 days and incubate. Always check on humidity when incubating and try to keep at 75% RH. Hatch rate decreases the longer it is left in the fridge. This is the most economical way of buying silkworms in bulk, without having to pay express shipping or ice-pack. Tips on hatching: Silkworms will hatch at 65 degree room temp but will take longer. DIY incubators are easy to make: simply use a large tupperware, place wet sponge or glass of water in it, next to your silkworm eggs, and a lamp over the container, closed to preserve humidity. You can do the same with the hatching cup. But be sure the lamp is not too close to the cup as to over heat it. Eggs will hatch in the spring in their due time when the temperature reaches low 70's without artificial conditioning as they are naturally spring insects. These eggs may come loose, glued down, laid on paper, or in pouches..